Easily connect to additional smart app features or interactive patient systems later. Along with standard TV, the A-Series TVs offer integrated relaxation and gaming apps. 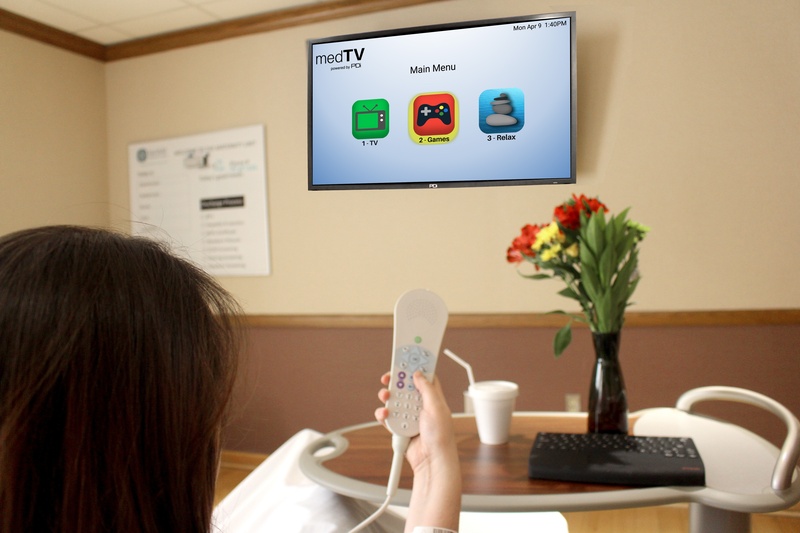 Patients can easily navigate a medTV icon-based app menu with a numeric or navigational pillow speaker. These apps require no internet connection for patients to use, making the A-Series a simple plug-n-play solution, with no additional computer module or internet hookups necessary. The A-Series TV is equipped with Pro:Idiom so patients can access more TV channels. When a patient wishes to switch up their entertainment from TV programming, they can easily access the simple medTV menu of 8 pre-installed games such as The Greedy Grub, Storm Cat, Witch Runner, Mining, Fishing, and Trivia, or choose from 3 soothing relaxation apps with sounds and imagery. These features allow the patient distractions to engage and have fun, or to relax and ease their minds as they heal. “Customers really appreciate the cost-effective options of the A-Series by PDi. They like that PDi designed the A-Series with flexibility to implement as TV only and having the same cabinet style as their existing PDi E-Series patient televisions, or the choice for using enhanced apps without requiring internet. Many customers are not yet ready with internet access.” said Jim Mick, VP of Sales and General Manager. The A-Series is designed to meet healthcare standards. The A-Series is UL-Listed and has standard features like universal pillow speaker recognition, volume limiters, multi-bed codes, closed captioning, cloning capability and more. Also, PDi’s rear-mounted DVD modules and mounting kits are compatible with the PDi A-Series televisions for even more entertainment or patient education options. PDi also manufactures and supplies complete TV mounting solutions for the A-Series TVs that meet every facility’s need. This includes Articulating Wall Mounts, Flat Wall Mounts, Table Stands, Secure Table Stands, and Ceiling Mounts with the highest quality, to ensure a secure attachment that will stand the test of time in a healthcare environment. Champion of the medTV Brand, powered by PDi.